The first challenge of the day was to find parking. For some undetermined reason, at 7:30am, the lines into Mickey & Friends were backed up almost to the freeway. 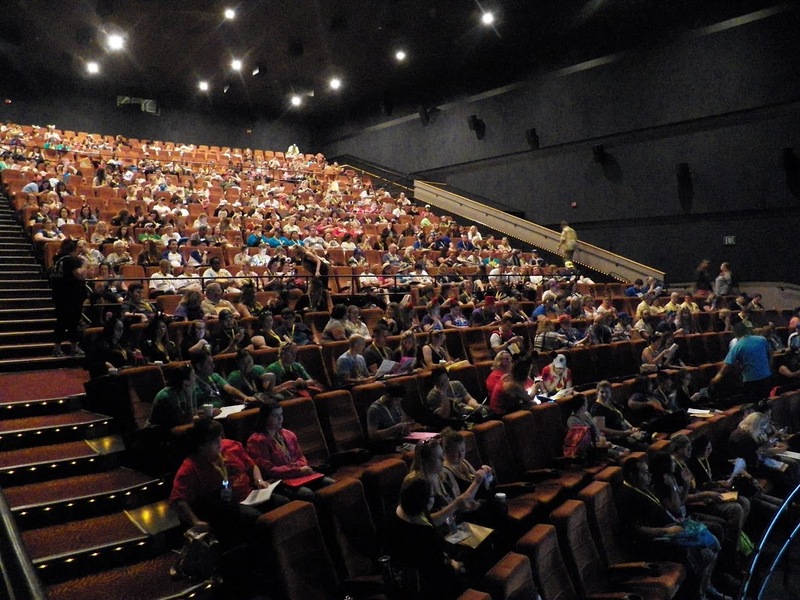 So, kudos to those who made it into the AMC Theater in time for the nervous warm-up routine that consisted of David asking people random questions about highlighter colors, plastic document sleeves and grease pens. 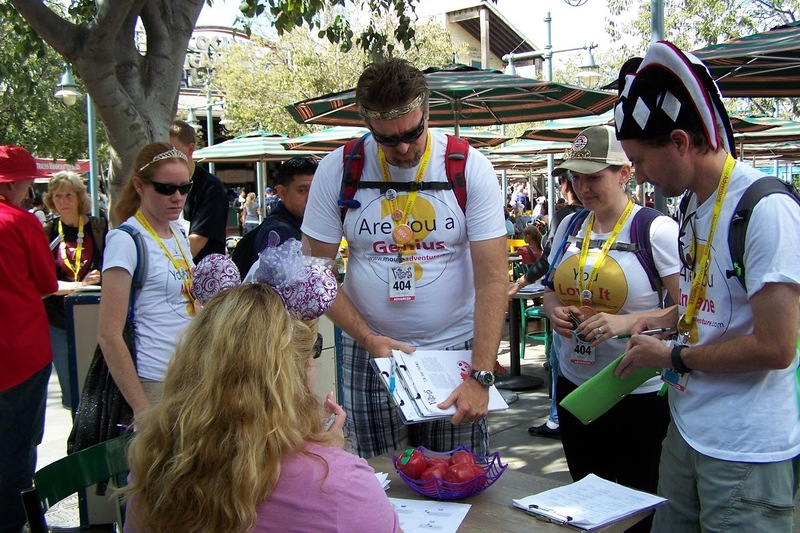 Basic teams were tasked with completing eight quests, a set of eye spy photos, and a set of trivia questions themed to Disney Villains; Advanced division teams received an additional three quests to complete in the same six hours of game time. Teams had to find their way to the Disney Animation building, and then to the Magic Mirror Realm inside of the Sorcerer’s Workshop. On one of the walls at the back of the space are a variety of villainous icons displayed next to one of the giant mirrors. Displayed from left to right, they are a bottle, a hook, an apple, a diamond, a pair of scissors, a spinning wheel, a pumpkin, a heart with a sword through it, and a seashell. Once placed in the correct order, the icons allowed teams to decode a letter column elimination puzzle. As this isn’t just a case of straight substitution, it was critical to have each icon in the correct place. The decoded question was: The Twilight Zone Tower of Terror features high speed drops into the dark what of the twilight zone? The answer could be found on sign on the entrance to the Fast Pass area for the Tower of Terror: Mysterious Realm. At first look, this quest seemed just a little too simple, but revealed itself to be quite sneaky. Printed on lavender-colored paper, the quest had a list of straightforward questions about Monstropolis. The answers to each of the 13 questions are found in the queue, kindly arranged in order. Once teams hopped into a Monstropolis taxi to go for a ride, they hopefully continued to try to work on the quest, as the key to decoding the quest’s final question was written on a mysterious blank area on the quest in black light ink. Lucky teams found the key right away, but others found themselves searching the park for other areas of black light. Once decoded, the final question asked “Monster faces on ride exterior.” The answer is 10. Many teams were stumped by the seemingly simple question, asking the staff at MouseAdventure Central “Is Boo a Monster?” The inevitable hint given back to teams was, “Well, is Boo a monster?” Some teams responded that she was wearing a monster costume, which led back to the same question. In case there’s any lingering confusion, Boo is not a monster. Some teams encountered difficulty completing this quest when the ride stopped operating for a short time during the game. This quest included a piece of perforated paper with a selection of images, words and letters, which were separated into strips and taped together to create a collection of Magic Band-inspired rings. “Magic Bands” assembled, teams then search for five different sets in Paradise Pier. Observing the many ways that teams juggled their “Magic Bands” during the quest was a delight: teams rolled up a piece of paper to hold the rings like a codex, attached the bands to a smaller player’s wrist, or just held onto them and tried to keep them aligned and in order as needed. Each correct image or name had a letter below it; as teams found the sets, they ended up with a five-letter sequence for each band. The first set, Firemen, can be found at one of the Paradise Pier Boardwalk Game booths, where firefighters are propelled up their ladders by players shooting hoses at their targets. While there are 5 firemen in the game, there were 6 firemen on the “Magic Band”, so the trick was figuring out which fireman didn’t exist. After teams arranged the “Magic Band” from left to right in the correct order, the answer to the first set was WHERE. The second set, Piers, is at King Triton’s Carousel of the Sea, which features images of famous piers and their opening dates. Once the bands were arranged to put the piers in order by date, the answer was CANYO. Set number three is on the Point Mugu Tattoo sign. Once the tattoos on the “Magic Bands” were in the same order as the sign, the answer was USEEO. The fourth set, Band Posters, are found under the Silly Symphony Swings. A details image was taken from each of the posters and had to be matched to the original. Once again, 6 images were shown on the bands, but the picture of the stool was a red herring. After arranging the images in the correct order, the answer read URSID. The final answer is on a sign facing the restrooms behind King Triton’s Carousel of the Sea: By The Seashore. Teams headed into a bug’s land to search for the images on their quest sheet, in order to get the key to the buggy code hiding the final question. Each picture showed a word with a missing double letter. Once teams identified the letter, they had to do some alphabet math, traveling down the colored path and moving forward and backward through the alphabet to reach the letter that went with the bug at the end of the path. After identifying the key to the code, it was a simple matter to decode the cipher on the previous page to reveal the final question: THE ROAD SIGN CALLS A BUGS LAND THIS ON ROUTE SIXTY SIX. 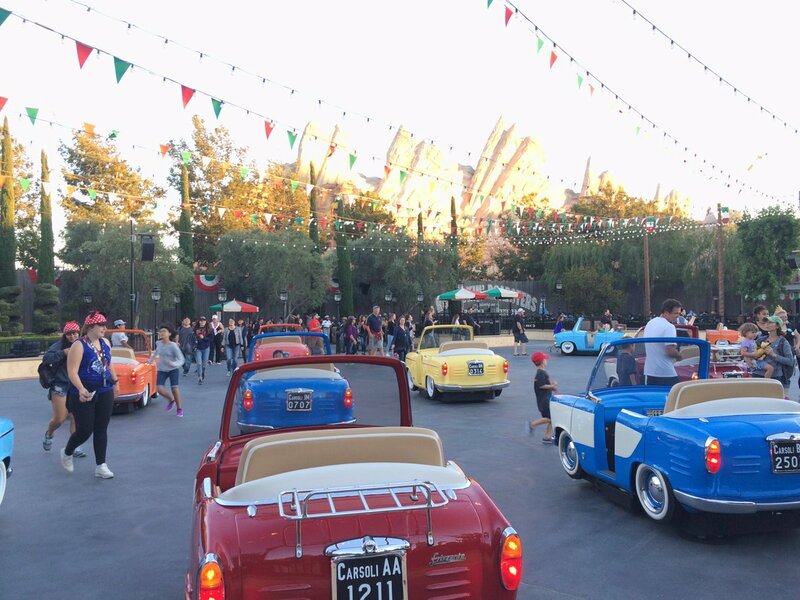 The answer, Biggest Little Wonder, is on one of the roadside signs opposite Luigi’s Rollickin’ Roadsters. Since many teams spent time working on Halloween Hoedown, the final answer should have been easy to find. When we tested this quest the day before the game, we discovered that It’s Tough To Be A Bug had been replaced with the Moana preview movie, and one of the signs we used was no longer visable. It was printed on the errata that teams are given at the beginning of the game. This quest was only included in the Advanced game, and had only one line of instructions: “It’s a nightmare, but it’s one exciting ride.” The quest itself included 12 images, each with one or two colored numbers below it. Teams found the images in Grizzly Peak, identified the adjacent text, and then used the colored numbers to index the needed letters. Teams took a trip to Redwood Creek, looking up, down and all around to find the images from this quest, and identify the missing words. Once written in the very small spaces on the quest sheet, key letters were copied into the grid by matching their icons. Teams then decoded the question by using the listed coordinates. For instance, the first clue “1,3” translated to first row, third column, or the letter F. Once decoded, the final question is: Friends threatened to boil his socks. Having already searched Redwood Creek to find all the pictures, teams had to find one more sign, which they had probably walked past as soon as they entered the attraction. The first sign directly to the right as you enter features a story where a gentleman made such a stink that his friends wanted to ease their pain. The man in question: A.T. Dowd. Many teams asked for clarifications and/or hints on this quest. It seems that possibly searching throughout the attraction for such small things lead them to miss the bigger picture. Teams were challenged to find the missing words in a “set,” basically a series of words or phrases that appear together. 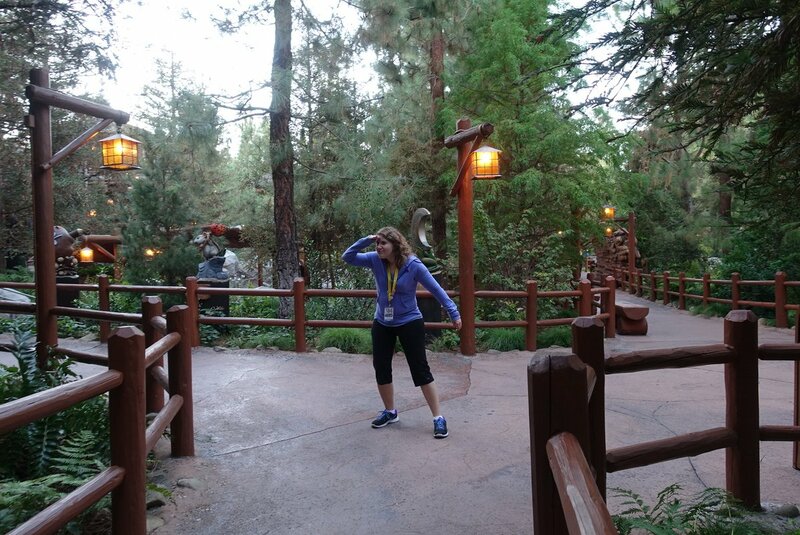 This quest did not, however, feature pretty pictures; instead teams hunted through Grizzly Peak, searching all of the areas where text can be found. Savvy teams used the capitalization of the provided clues to help them in their search. Once all of the missing words were found, teams eliminated the letters from the cluster on the quest sheet, leaving seven letters to unscramble to COURAGE. To get the final answers, teams had to find the two words that completed the set. This quest led teams all around Grizzly Peak, and lead to a lot of work with pencils and erasers if you had the wrong letters, words, or just lost track of how many of each letter you had. This game’s rules provided a clue to teams: “Players may not enter any store, or any restaurant that accepts reservations.” Since it does not accept reservations, teams could search inside Smokejumper’s Grill, where their flag flies high, with the motto Strength, Courage, Integrity. The final answer for this quest: Strength Integrity. A traditional Halloween activity is bobbing for apples – dipping your head into a large bucket of water to pick out an apple with your teeth. MouseAdventure used this as a metaphor, rather than actually asking teams to get wet. Teams visited MouseAdventure Central, where they had to choose one from a basket of plastic apples. Once teams chose an apple, they cracked it open to see if it was a “good” apple or a “poison” apple. Good apples were rewarded with The Letters from the Refuge quest and sent on their way. A “poison” apple meant that the team had to wait at least thirty minutes for the poison to wear off until they could bob again. Unlucky teams that picked a poison apple on their second visit were guaranteed to get the quest on their third visit. Every team had the same chances of getting a good or bad apple – each basket had three good apples and three bad apples throughout the day. Once decoded, the final quest was: Find and decode Atlantean in workshop. The only workshop in Hollywood Land is the Sorcerer’s Workshop, where there is a beautiful piece of art behind the DIY zoetrope setup. Decoding the Atlantean on the wall leads to the following, final, answer: Walt & Roy. Special note here should be taken that not only are Walt & Roy encoded in Atlantean, but they are also written in well-obfuscated English if you looked hard enough. Buena Vista Street is such a quiet, relaxed street, that teams should have had no trouble finding the twelve missing words in this quest. Certain letters in the answers had numbers associated with them, which were then transferred into the matching boxes at the bottom of the tree puzzle, which is sometimes called a bubble-up puzzle. Once the puzzle is filled in, it reveals the final question: The standard in transmitted sound. Teams that attempted this quest walked away with a tremendous affinity for the Italian crooners favored by Luigi and his dancing cousins… We hope. Teams were asked to identify which of Luigi’s cousins were not rollicking on the dance floor during game time. Starting with a list of 20 cousins and their key characteristics, teams had to go through and meticulously determine which cousins were visible, in order to determine who had the day off. 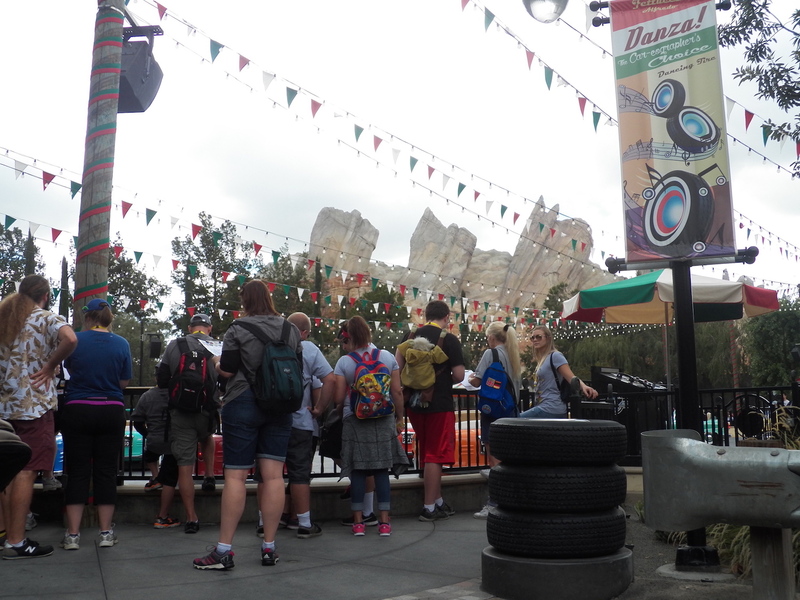 Unlike most MouseAdventure quests, there was no way for the quest writers to know the answer in advance of game day – instead, staff checked the attraction several times during the game to determine which cars missing. At one point, we were told by a couple of teams that they had watched as one of the cars had to be taken out of service – we knew that we now had to an additional correct answer. The MouseAdventure Staff and Crew who were assigned to check in on this attraction had a major advantage over the teams: they had a sheet with all the cousin’s names, their descriptions AND license plate numbers. For the folks assigned this vital verification task, it still took about 10 minutes just to confirm who was rollicking! The original final answer to this quest was: Carmela & Gina. The additional cousin who was rested about halfway through the game: Carlo. Thirsty or inadequately caffeinated teams playing in the Advanced division found themselves drawn to the Fiddler, Fifer & Practical Cafe to find a display of mugs. The quest included pictures of 8 souvenir mugs, which were displayed in a circle around a map of California, with a string leading from each mug to its location on the map. The trick to this quest was determining the order of the mugs according to the map locations, starting with the most northwest location and proceeding clockwise around the state. Teams that missed the instruction to use the map locations, rather than the order of the mugs as displayed, would get the wrong answer to the quest. 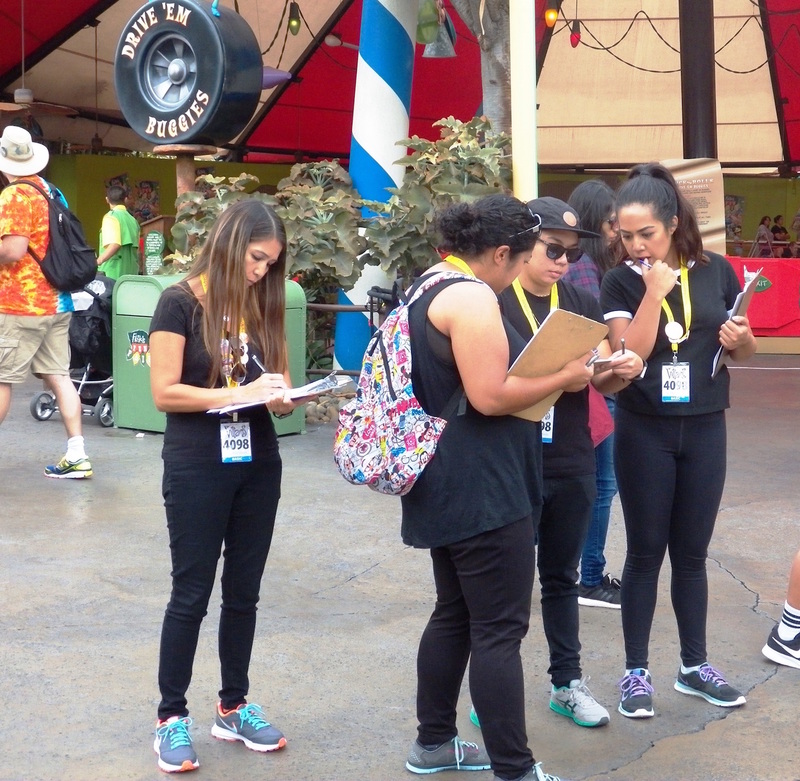 Before they could find the correct mug to answer the quest, teams had to find answers to 14 questions, which were found throughout Disney California Adventure. Once they had those answers, they would huff (subtract) or puff (add), around the map to determine a specific mug as their final answer. The final answer for this quest was mug H.
Over the years, MouseAdventure has featured an Eye Spy quest in many different forms. One year, Goofy helped take all the pictures, but managed to get his gloved hand in front of the one piece of information we really wanted. This time around, Randall was super helpful in identifying doors found throughout Disney California Adventure. Each cast member door is themed to the area in which it is found in Disney California Adventure. Randall has camouflaged himself into each door, hiding signs that detail who is allowed to enter. Teams had to find each door and identify who is allowed through it. The footer of quest and rules pages contain a copyright symbol next to Third Gate Games. However, not all of the symbols contain the letter C. Starting with the rules pages, and continuing in the order of the quests as presented on the quest packet envelope, the provided letters spelled out AIRFIELD ROAD NAME. The map next to the Rambler in Grizzly Peak shows a road passing through named Red Top Road. Full results for Family, Basic, Advanced, and Day at the Park teams are available. Total possible points for the Basic division was 470 and for Advanced was 610. The best new team (not otherwise placing) was The Riverboat Pirates with a score of 263 points. Congratulations to the four winners of our #MAVillains photo contest. Players uploaded photos showing their MouseAdventure spirit to twitter and Instagram after turning in their answer sheets for a chance at a prize. The Third Gate Games staff (Chris Metzger, David Perry, Joe Stevano and Stephanie Wien) would like to thank all of the people who helped make this game possible: Shoshana Lewin wrote up the Villain-related trivia questions. Shoshana Lewin, Janis Maggs, Nathaniel Maggs, CJ Martin, Tommy Metzger, Katie Metzger, Jeffrey Moxley and Amanda Smith helped to crew the game, and Lora Parral & Aaron Maggs acted as our event photographers. Third Gate Games would also like to thank those among the above who helped test out the game prior to our event. The next MouseAdventure event will be at Walt Disney World on Saturday, March 4th, 2017. Registration will open for the Florida event after the new year. See mouseadventure.com for more information on upcoming events.